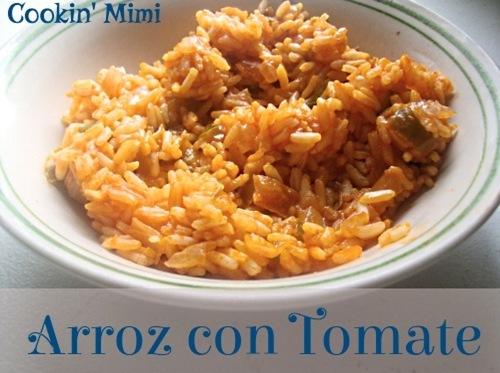 This is the second Mexican rice dish I have on the blog. The other Mexican rice is more like the kind in a box that uses diced tomatoes. This one uses tomato sauce and has diced onion and bell pepper in addition to the rice. This would be delicious served with vegetable quesadillas and refried beans for a meatless meal. Heat the oil in a sauce pan with a tight fitting lid. Cook the bell pepper, onion, and garlic for four to five minutes. Add the rice and cook for another five minutes, stirring frequently, until rice is translucent. Add the tomato sauce and chicken broth. Bring to a boil, cover and reduce heat. Simmer for 15-20 minutes or until rice is cooked and the liquid is absorbed. Thanks for linking up to All My Bloggy Friends, Micha – I’ll be sharing this on Facebook later today!